Simple Paleo Waffles are just that. Simple. They are tasty with or without the cinnamon added. 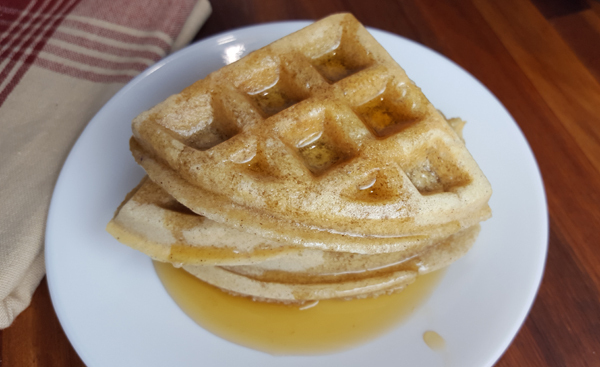 Eat them topped with the classic, maple syrup, or check out some of my favorite Paleo waffle toppings below. I have also included simple freezing and reheating instructions below to make this a quick Paleo breakfast. In a medium mixing bowl, combine almond flour, tapioca flour, coconut flour, and baking powder mixture. Using a whisk or hand mixer, add the wet ingredients, one at a time to the flour mixture. Mix batter until well combined. Heat your waffle iron according to the instructions to medium heat. If your waffle iron is on or off, like mine, just preheat. Brush with avocado oil, if it is not non-stick. Fill your waffle iron with waffle batter, according to its instructions being careful not to overfill. This is usually about ½ cup. My daughter has this mini waffle iron she likes to use. It’s made by Dash and is available on Amazon. Kids will love it! Cook until the waffle iron indicator light comes on or until steam no longer comes from your waffle iron, waffles are slightly browned, and the waffles release easily (times will vary). 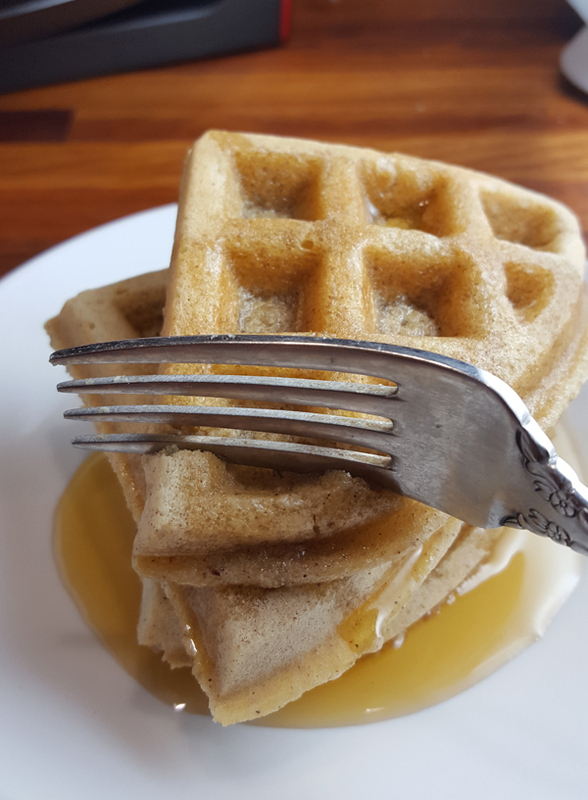 Gently remove waffles from the waffle iron by lifting them with a fork, being careful not to scratch your waffle iron. Enjoy! Make your own pie filling, coconut whipped cream, chocolate syrup, or Paleo Caramel Sauce. Top with your favorite fruit, like blueberries, strawberries, bananas, fruit salsa, or cooked apples or peaches. Top with chocolate chips or chopped nuts. What are your favorite Paleo waffle toppings? Let me know in the comments. Allow waffles to cool . Place waffles between layers of parchment paper and place in freezer bags. Remove as much air as possible without smashing your waffles, and seal. Allow to thaw and place back into your waffle iron and heat thoroughly. This will help make them crispier again. Make your own pie filling, coconut whipped cream, chocolate syrup, or Paleo Caramel Sauce. Top with your favorite fruit, like blueberries, strawberries, bananas, fruit salsa, or cooked apples or peaches. Top with chocolate chips or chopped nuts.